As aspiring age group triathletes, we mostly are all reaching for that improvement in fitness and race times year after year. If you compared your first race to say, your 25th, you’ll probably think sot yourself “wow, I’m getting speedy!”. I know I look back and couldn’t imagine running sub 7 for 13.1 miles, but I have now. And then you find people like Kevin Denny, and you know what speed really looks like. Just check out his resume of racing. He’s a member of the Every Man Jack team and is loaded up for the 2018 season. He also happens to live in Kansas City, and I’ve had the honor to be pummeled by him several times in races and have unique access to this high level elite amateur triathlete. March 26 – Great Plains 10k – 32:53. 1st overall. April 8 – Rock the Parkway half marathon – 1:14:25. 4th place overall. May 14 – Kansas City Triathlon – 1:58:55. 2nd overall. Raced against pros. May 21 – Ironman 70.3 Chattanooga – 3:56:05. 1st AG, 2nd Overall Amateur by 8 seconds. (shortened swim (and down river)). August 12 – Age Group Nationals Olympic Distance – 2:00:12. 7th overall, 3rd AG 25-29. August 13 – Age Group Nationals Sprint Distance – 59:53. 2nd overall. 1st AG 25-29. September 10 – Ironman 70.3 World Championships (in Chattanooga) – 4:20:19. 9th in 25-29 AG. 24th overall amateur. 54th overall. 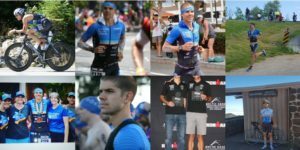 Recently Kevin graciously agreed to answer a few short fire questions on his racing, training and tips for Chattanooga 70.3 since he was at the venue twice in 2017. Don’t forget Kevin still works a full time job during the day and still pulls of training and racing at the elite level. So, without further delay, here they are! Question 1 : Tip each for swim, bike and run that’s helped you improve the most (3 tips total, 1 per discipline)? Question 2 : Two of the biggest lessons learned from overall training perspective to make the transition to a KQ speed and endurance? Question 3 : Biggest tip after racing IM Choo 70.3 to help 2018 athletes get the best race? There you have it. Some gold from a a very fast age grouper for you to chew on while you’re Zwifting away getting ready for your 2018 season.